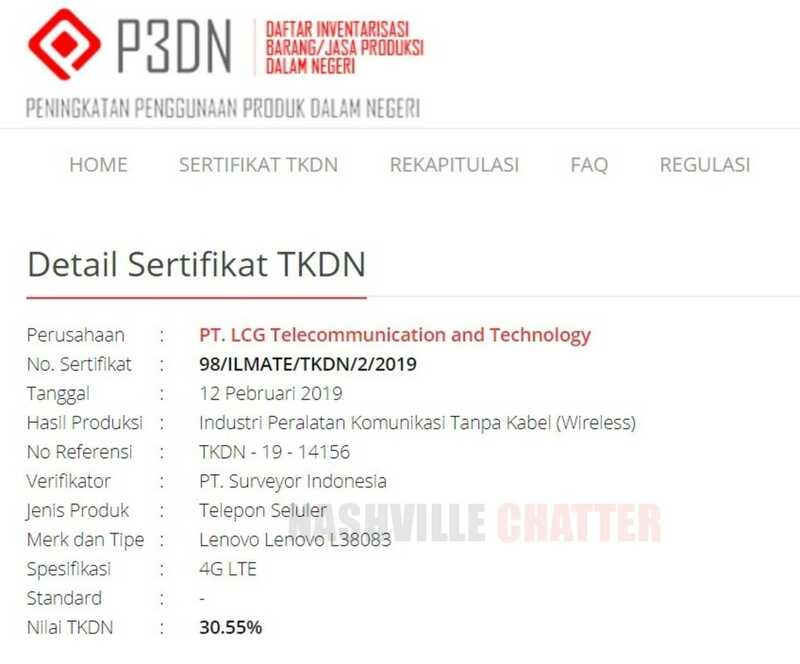 An upcoming ‘K’ series Lenovo smartphone with model number Lenovo L38083 has been certified by TKDN authority in Indonesia. It is the very same phone that had appeared on Geekbench in the previous month. However, the exact identity of the smartphone and the name is still under the wraps. The Lenovo L38083’s appearance on Geekbench had revealed that it is fueled by MediaTek Helio P22 chipset and 4 GB of RAM. The handset is loaded with Android 9 Pie OS. These specs suggest that it will be an upcoming mid-range phone from the company. There is no information available on the other specs of the device. The Lenovo K9 that was released in October 2018 was powered by the same Helio P22 SoC. In terms of specs, the Lenovo L38083 seems to be a better phone since the K9 featured just 3 GB of RAM. All the Lenovo phones with model numbers starting with “L380” in the previous year had debuted as K-series smartphones. Hence, there is a possibility that the Lenovo L38083 could be the upcoming K-series phone from the company. Last year, the Lenovo K5 was introduced in March 2018. It came with 5.7-inch IPS LCD display with HD+ resolution and had 18:9 aspect ratio. The MediaTek MT6750 SoC powered the smartphone along with 3 GB of RAM. It came with 32 Gb of native storage. For photography, it featured 13-megapixel + 5-megapixel dual camera setup and an 8-megapixel front-facing shooter. It included a 3,000 mAh battery and a rear-facing fingerprint scanner. The Lenovo L38083 may debut as Lenovo K5 (2019) or Lenovo K6 or bear any other name. As the Lenovo K5 was announced in March last year, the Lenovo 38083 may go official in the coming month. We advise you to wait for further reports before confirming on the identity of the smartphone.